Philippe Kahn, a French entrepreneur, was waiting for his baby daughter to be born when he hit upon the inspiration for the world’s first camera-photo. It was a summer evening in 1997, and Philippe Kahn was anxiously waiting for his daughter Sophie to be born. Desiring to share her birth instantly with family and friends, he conceived what would become the world’s first camera phone. The Internet was only four years old and only good for simple email with limited wireless connection. So he bought a Casio QV-10 digital camera and inserted it into a Motorola Startac phone. 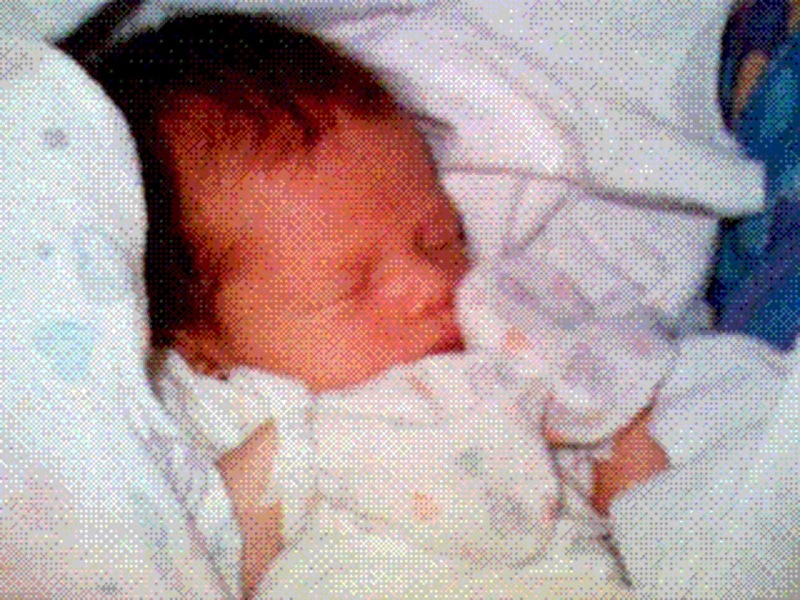 When Sophie was born, her photo became the first ever camera-phone image, something that, 20 years on, we take for granted. Newborn Sophie Kahn — the person who inspired the first camera phone. Now Kahn runs several companies, including Fullpower, founded in 2003, which provides a patented ecosystem for wearables and Internet of Things products. The inspiration for his main product, the Sleeptracker Monitor, stems from Kahn’s passion for sailing — he owns a team called Pegasus Racing. During a demanding race that means sailors have less than an hour’s sleep in a 24-hour period, Kahn began experimenting with biosensors and three-axis linear accelerometers that could detect micro-movements. Kahn created prototype sleep trackers using biosensors that optimised 26-minute power naps to maximise sleep benefits and sail time. Sensor-fusion is at the heart of our work at Fullpower together with AI, Machine Learning and Sleep and ambulatory sciences. CHRISTMAS Day was one of the biggest online shopping days of the year. Experts put it down to our increasing obsession with mobile phones. So as we hunt out the bargains – frequently on new handsets we’ve just taken out of the Christmas wrapping – here’s what you may not know about your mobile best mate. The very first smartphone was launched on August 16, 1994, by IBM. It was a pioneer in commercially available touch-screen phones. Nine out of 10 mobile phones in Japan are waterproof as many people even shower with them. With a price tag of $15.3 million an Apple iPhone 5, with a 26-carat black diamond in place of the “home” button, became the world’s most expensive phone. Next year over a third of the world’s population will own a smartphone, with 2.6 billion users. Since Apple’s App Store was created in 2008, more than 140 billion apps have been downloaded – but a quarter are only used once in the six months after downloading. Almost 85% of phones use the Android operating system – like Samsung’s – not Apple’s iOS. You should charge your phone little and often and not necessarily leave it charging overnight when it has reached 100%. Studies have shown the average mobile phone is covered with 18 times more bacteria than a toilet handle. Mobile phones are now so common some people have developed a fear of being without one. This is called nomophobia. Even if you have an older phone it’s still around 30,000 times more powerful than the computers used to take Apollo 11 astronauts to the moon. A staggering seven trillion texts are sent every year worldwide. In the UK 93% of adults own a mobile phone and 14% of us now live in a home without a landline. The first portable phone was called a DynaTAC. The original model had 35 minutes of battery life and weighed a kilo. The first public mobile phone call in the UK was made by comedian Ernie Wise in 1985 from St Katharine dock to the Vodafone head offices. Less than one in 10 Eritreans have a mobile phone subscription – but in Kuwait there are more than two for every person. The first photo message ever was sent in 1997. The inventor, Philippe Kahn, took a snap of his newborn daughter Sophie and sent it to friends and relatives. Each person in the UK sends on average 170 text messages every month. The Sonim XP3300 is officially recognised as the world’s toughest mobile. It can be dropped 84ft on to solid ground without breaking. Forget iPhones or Samsung Galaxys – the world’s biggest selling phone is the classic Nokia 1100. There have been 250 million of these handsets sold over the years. Sick of your phone’s battery running out? Try Russia’s Vobis Highscreen Boost 2. It boasts two batteries and doesn’t require recharging for two weeks. The Willcom WX06A is officially the world’s smallest phone, measuring just 3.2cm long. The battery is so small it only has a life of two hours. Think your phone bill is too big? Spare a thought for Frenchwoman Solenne San Jose. Her bill clocked in at £9.5 quadrillion (that’s nearly 40 times the combined wealth of the entire world). Thankfully it was a mistake and she didn’t have to cough up. The first ever text message came from a Vodafone engineer to his boss. It was sent on Christmas Eve and read, appropriately enough, “Happy Christmas”! NEW YORK – A single drop of milk, a newborn baby and the ravages of war and terrorism are included in a multimedia project featuring Time magazine’s most influential images of all time, released Thursday through a new book, videos and online. Many of the photos or frames from films are familiar, ingrained in the collective conscious, including the Pulitzer Prize-winning “Falling Man,” taken on 9/11 by Richard Drew of The Associated Press. Others, and their stories, are little known, such as the tiny snap by Santa Cruz software engineer Philippe Kahn of his new baby, the first cell-phone picture, after he rigged a flip phone with a digital camera in 1997. The magazine’s editors consulted historians and photo editors and curators around the world, while Time staff wrote essays on each image. Fullpower is the leader for cloud-based IoT smart-home and wearable solutions powered by AI, machine-learning and data science. With more than 125 patents, the Fullpower IP portfolio covers the AI-powered Sleeptracker® and the MotionX® IoT technology platforms for the Smart-Home and wearable. Fullpower’s business model is to license technology and IP to brand leaders such as Nike, BeautyRest, Serta, Amazon, Movado and others. Founded by Philippe Kahn, creator of the first camera-phone and based in Silicon Valley, the Fullpower team is passionate about technology craftsmanship, innovation, and the AI-IoT paradigm shift. San Francisco, CA, October 18, 2016 (Newswire.com) – Fullpower® Technologies today announced it has been awarded another important patent covering a sleep monitoring system, US 9,459,597 B2, including a “Method and apparatus to provide an improved sleep experience by selecting an optimal next sleep state for the user”. This enables the user to optimize their sleep patterns by adjusting the environment, bedding, and room temperature for optimal sleep to feel more refreshed. Click to read the patent. The place of innovation and invention: An interview with Danielle Newnham for her book in 2013 and 3 years later and shows how we brought the Fullpower IoT agile development platform to market with the Sleeptracker Smartbed and Nike+ as wearables commoditized. When children are the magical catalyst that makes it all happen with Mom and Dad. Thank you Sophie Kahn , “The Camera-Phone Baby” for being such a talented inspiration!